WEIRTON — Representatives of local labor, industry and government were told Tuesday the business climate is turning around in the region, and efforts continue to attract new jobs to the Ohio Valley. 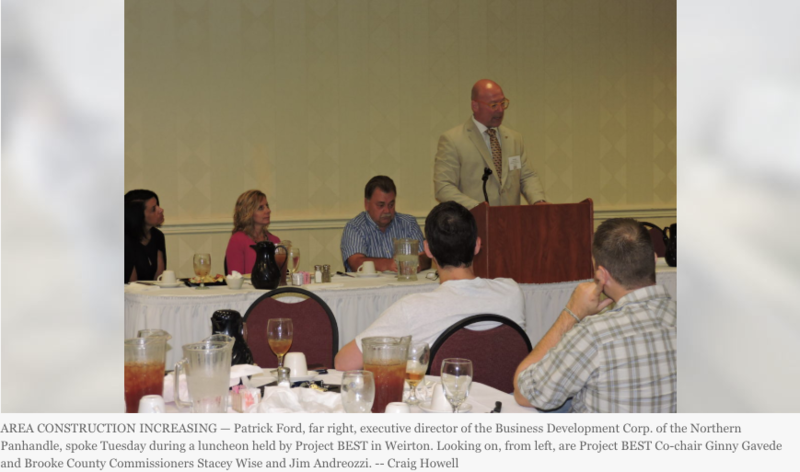 The discussion took place during a networking luncheon with Project BEST, held at the Holiday Inn on Three Springs Drive. Project BEST is a labor-management company formed by the Upper Ohio Valley Building and Construction Trades Council and the Ohio Valley Construction Employers Council to promote local labor. “I think economic development works best when you’re all equally informed,” Co-chair Ginny Favede said, explaining the group regularly holds luncheons and other events, rotating them through communities in the area. Patrick Ford, executive director of the Business Development Corp. of the Northern Panhandle, served as Tuesday’s guest speaker, discussing the turnaround in economic development and the growth of construction jobs in the region during the last decade. “The Northern Panhandle of West Virginia had gone through a dry spell for years,” Ford said, noting that in 2009 the BDC began focusing on particular industry clusters that would best fit the region, cataloging available land and marketing the region. Among those focuses are energy, chemical, transportation, value-added metals and healthcare. Those efforts, since 2012, he said, have brought approximately $400 million in private investment to Brooke and Hancock counties and $600 million to Jefferson County. He added construction, in particular, has benefited from the various development projects, explaining there were 5,500 construction jobs in 2010 compared to approximately 10,000 now. He said that growth actually has strapped the pool of available laborers. Ford noted two comments he hears regularly about the local labor force focuses on drug issues and some having no desire to work. “It’s so much of a common theme, it’s become frustrating to hear,” Ford said. When speaking to prospects, though, he promotes the muscle memory of residents, as well as the supply chain and transportation options. Many of those prospects, he explained, represent international companies, with some including Bidell Gas Compression, Pietro Fiorentini and JSW making significant investments. “These companies have been studying our labor force more than our domestic companies,” he said. One of the ways Ford noted to reverse the trend and provide a larger labor pool, is to work with area vocational programs to provide training more suited to today’s needs, training teens and young adults so they are ready for the industries when they finish school. “They figured this out in Europe and Asia decades ago,” Ford said. Ford also discussed some of the planned public projects slated for the area, including infrastructure enhancements along Three Springs Drive, improvements to the courthouses in both Hancock and Brooke counties, sewer and water projects in Brooke County, improvements at the Beech Bottom Business Park and the Route 2 alignment in New Cumberland. He said work continues by the Frontier Group of Companies to demolish former steel propety in Weirton, with the hope of attracting new business prospects. The group also heard from Phil Carl, vice president of Warwood Tool, who spoke about the company’s history and products, as well as its latest venture with the creation of Warwood Media Group, a marketing company geared toward promoting local industries and labor.